God bless YLE, Finland’s public service broadcaster, for its ever-innovative ways of spending the TV licence fee. A malicious puppet show about national icon Carl Gustaf Mannerheim was apparently not enough. Now YLE is shelling out for an arty Swahili film, The Marshal of Finland, about Mannerheim’s love life, in which all the parts are played by Africans. The Finnish right wing is having conniptions. I’m rather looking forward to it. How much of Mannerheim’s incredible life and bizarre adventures would translate to Kenyan locations? How might a black actor capture the character and hauteur of one of the whitest men in history? As far as post-modern drama goes, this is surely a world-class bonkers idea. It might even work. And if it doesn’t, it’s going to be the biggest car crash in the history of television. Someone had a meeting about this. A group of earnest Finns sat around an Ikea table and picked at biscuits from a MariMekko tray, while a crazy-haired producer said: “Also, there’s a bunch of Kenyans who want to shoot a movie in five days about Mannerheim’s life story. In Swahili. Sounds great, right?” Nor is this likely to have been some manifestation of the deluded hyper-inclusionism of the BBC, which recently decided The Hollow Crown needed to have a black Duke of York. No. Someone at YLE thought this would be a really great idea, and they will either be running the channel soon, or looking for a new job. The Finns are so animated about Mannerheim that nothing really surprises me any more. When I wrote my book about him, concentrating on his relationship with China and Japan, the Finnish translation was actually published a week ahead of the British “original”. Mrs Clements and I often play Mannerheim Bingo in Finnish bookshops, trying to guess what odd spin on his life will be the next to get published. There has been a comic about his tiger hunting days. There has been a (rather good) Mannerheim cookbook. And the aforementioned puppet show, which claimed he had a Kirghiz catamite, and showed him partying with the Grim Reaper during the battle of Tampere. But that’s a problem with being a national icon; you need to be robust. I will definitely be tuning in for Black Mannerheim, but that’s because I am a Mannerheim fanboy, on the record as saying that he is one of the greatest figures of the 20th century. But one can’t help but wonder what the real agenda is behind this. Is someone at YLE making a post-modern point about icons and heroes, or is this that other recurring element of Mannerheim’s legacy — the substantial number of Finns whose ancestors were defeated Reds, and who can’t resist the chance to carnivalise his memory in ever odder combinations. If so, Mannerheim is sure to survive this latest assault on his dignity. Mannerheim’s enemies had a field day with the animated Butterfly of the Urals, because its vague and unsupported insinuation about his sexuality became a swift-travelling meme among young idiots who never saw the programme, but liked being able to repeat the new “rumour”. But there is no such message here — instead, its artistic heritage is far more likerely to be a restatement of a truth that many Finns already acknowledge, that Mannerheim’s story is so amazing, and so eternal, that even actors in distant Kenya are inspired by it. 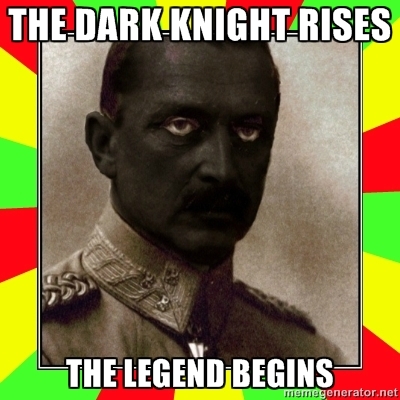 This entry was posted in News and tagged Black Mannerheim, Finland, Finnfilms, Finns are mad, Mannerheim by ixarette. Bookmark the permalink. First I must confess that I haven’t read your (or anyone else’s) Mannerheim book—all I know about him is from this blog, basically. I really just wanted to say that sometimes I bless my stars for RSS feeds. They let me see when people update posts and what exactly they changed, and this was a more than usually entertaining set of changes. I love watching creative processes in action. Please don’t let this comment prevent you from posting first and editing later. Hi Sean — normally I write blog posts weeks in advance, but this was one I really wanted to get up online ahead of the next spin of the news cycle. So yes, if you were watching it in real time you probably caught that rarest of things, an author’s mind at work on the page, checking facts, refining arguments, and in one case actually adding some new information that Annukka from my Finnish publishers just emailed to me.